64 PORTRAIT OF PRINCE DMITRY GOLITSYN. 1762 Oil on canvas. 97 X 78 cm. Inv. No 894 Signed and dated: Peint par Drouais le fils en 1762 Dmitry Golitsyn (1721—1793), son of Field-Marshal General M. Golitsyn, was a famous Russian diplomat. 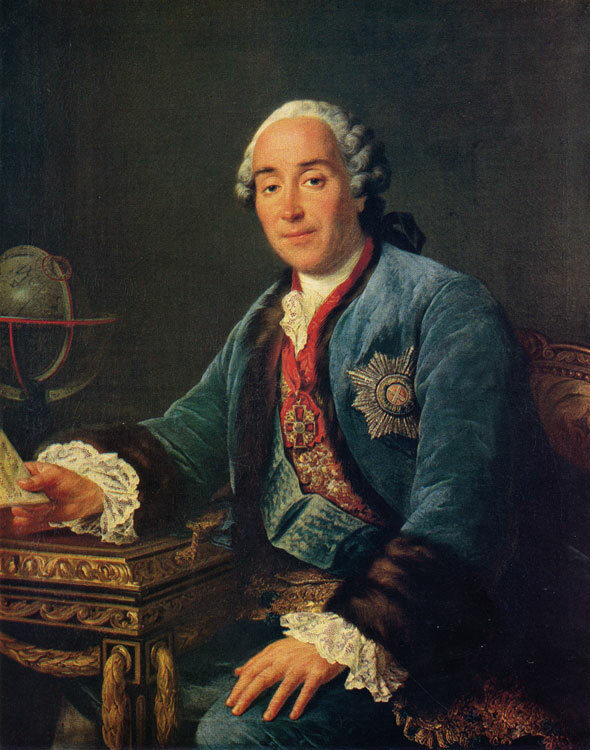 From 1757 he lived in Paris, in 1760 was the Russian ambassador there. From 1761 to 1791 he was the Russian ambassador to Vienna. A connoisseur of art, he assembled a large collection of paintings. He founded the Golitsyn Hospital in Moscow. The picture is a pendant to the portrait of Princess E. Golitsyna by L. M. Vanloo (The Pushkin Museum of Fine Arts, Inv. No 747). Engraved with a burin by J. Tardieu. Provenance: until 1918 The Golitsyn Hospital, Moscow; 1919—24 The Rumiantsev Museum, Moscow; since 1924 The Pushkin Museum of Fine Arts, Moscow Exhibitions: 1763 Paris (Salon), Cat. 155; 1905 St Petersburg, Cat. 355; 1918 Moscow, Cat. 86 Bibliography: Кат. ГМИИ 1948, p. 30; Кат. ГМИИ 1957, p. 55; Кат. ГМИИ 1961, p. 78; H. Голицын, Род князей Голицыных, St Petersburg, 1898, p. 138; Русские портреты 1905—9, vol. II, No 26, ill.; Reau 1924, p. 258, ill.; Reau 1929, No 513, ill.; Золотов 1968, p. 134, ill.